Conservation Alliance Tanintharyi (CAT) Report Cover - Source: . The conservation area claims to compensate for the impacts of three gas pipelines, excluding however indigenous practices and failing to respect rights of people to return to their homelands. The Tanintharyi Nature Reserve (TNR) was among the first protected areas in Tanintharyi region. Established in 2005 in Yebyu and Dawei townships, the conservation zone covers about 170,000 ha . The project is funded by major gas companies that run three pipelines across the area and the main aim is to compensate for some impacts on biodiversity caused by the pipelines and support facilities. In relation to this aim, the conservation project is proposed to continue for the lifetime of the pipelines, at least until 2028 (see Project Details, below). While the TNR is currently the only terrestrial protected area in Tanintharyi, plans are being made to massively extend conservation zones in the region . 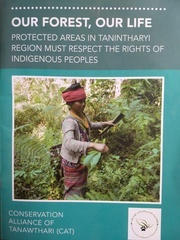 Despite being promoted as a successful conservation project by the Myanmar government and the Wildlife Conservation Society [see 2 and 6], a new report, published in 2018 by an alliance of seven civil society groups, argues the protected area has a “troubling history of human rights violations” [Conservation Alliance of Tanawthari (CAT) report, see 1, page 12. See also related conflict, Yadana gas field and pipeline, Myanmar). For generations, the forests located in the Nature Reserve have supplied ample livelihood resources for Karen, Dawei and Mon communities. In the past, they lived in dispersed settlements across the area and practiced shifting cultivation - a land use practice recognized for its important positive effects on biodiversity . The area also hosted villagers’ betel nut and fruit orchards and the forest provided them with food, medicine, water and shelter [1, see also 4]. During the civil war, most villagers were forced to move into controlled settlement areas and many of those who refused to do so had to flee to bordering Thailand. The civil war and the military measures to establish controlled hamlets left many areas temporarily vacated, which were later taken to establish the TNR. However, the land was “neither virgin nor vacant”, the report says “but the land of IDPs and refugees who would soon return to reclaim their homes and agricultural lands” . There was no prior consultation and consent of local communities and the internationally recognized rights of internally displaced people (IDPs) to return safely and voluntarily to their homelands have not been respected, says the report . Instead of considering the rights of the IDPs, and the biodiversity sustained by indigenous practices [see e.g. 3, 5], many of their traditional livelihood activities were subsequently considered as “chief threats to [the] conservation targets” [2, page 20]. Many who are returning now following the 2012 ceasefire agreement find themselves unable to resettle but dispossessed of their traditional livelihood resources and cultural environment . The CAT alliance of civil society groups says the “Tanintharyi Nature Reserve legalized the forced exclusion of Karen people from their customary lands under the guise of conservation”. Given the plans to massively extend protected areas in Tanintharyi region, the groups remind that “new protected areas in the region must not repeat this same human rights violation” [1, page 13]. Instead of top-down conservation planning, approaches led by and centred on indigenous people are required. 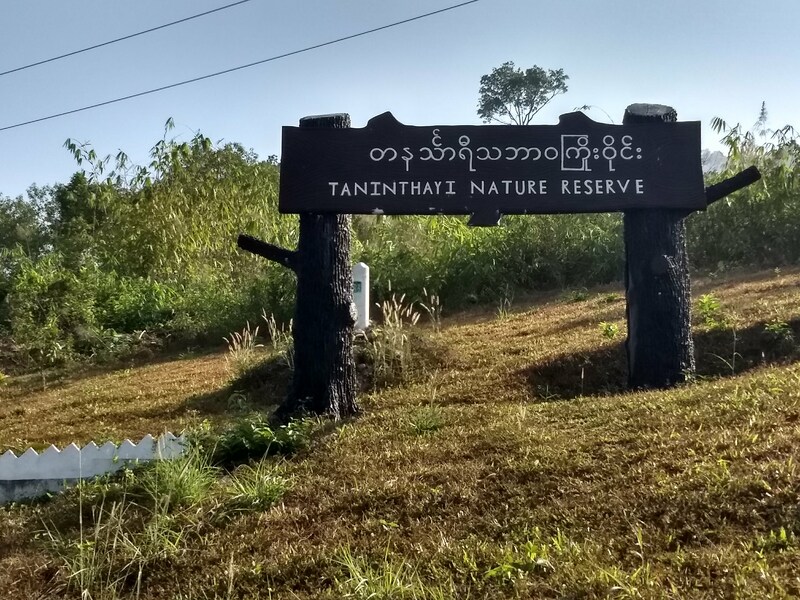 Project Details The Tanintharyi Nature Reserve (TNR) is a public-private partnership project developed by Myanmar’s Forest Department and several private companies that have constructed pipelines across the area of the Nature Reserve. The conservation zone was established through a ministerial notification on 30th March 2005 and covers about 420,000 acres (ca. 170,000 ha). Technical support was provided by the Wildlife Conservation Society (WCS) and the company ‘The Biodiversity Consultancy’ was contracted to document and review the project [see 2]. The Forest Department has the full responsibility to implement the work plans established for each phase. The partnership model is based on a voluntary contract between the partners and was developed independent of any clear legal framework [see 2]. The establishment of the Tanintharyi Nature Reserve is closely linked to the establishment of the three pipelines running through it. According to the consultancy report by The Biodiversity Consultancy , the budget for the protected area was 1.2 million USD for Phase 1 (2005-2009) and 1.2 million USD for Phase 2 (2009-2013), which involved the Motamma Gas Transportation Company (MGTC) pipeline from the Yadana Gas field and the Taninthayi Pipeline Company (TPC) that ships gas from the Yetagun field. For the construction of the third pipeline by Andaman Transportation Limited (ATL) - shipping gas from the Zawtika field - a budget of 1.8 million USD was announced (Phase 3 of the Protected Area development, 2013-2016). [see 2]. The MGTC company is a joint venture of Total Exploration and Production Myanmar, state-owned Myanma Oil and Gas Enterprise (MOGE), PTT Exploration and Production (PTTEP) and Chevron. The Yadana pipeline is operated by Total on a 30 years license and runs for 63 km in Myanmar before crossing to Thailand. 55 km of the pipeline are located within the Tanintharyi Nature Reserve (TNR) . According to the consultancy report [2, page 21], the “Taninthayi Pipeline Company (TPC) is a joint venture of Petronas Carigali Myanmar Limited (PCML), MOGE, PTTEP and JX Nippon Oil and Energy. The pipeline is managed by Petronas on a 30 year licence”. The third pipeline is developed by Andaman Transportation Limited (ATL), a joint venture of PTTEP and MOGE. Of the 65 km onshore in Myanmar, 55 km run through the Tanintharyi Nature Reserve . The Tanintharyi Nature Reserve consists of three zones [see 2]: i) a core zone (136,347ha), in which no villages, roads or whatsoever infrastructure is allowed, and access is restricted; ii) a buffer zone, in which subsistence activities are allowed, and iii) a Transportation Corridor where the pipelines, service tracks and metering stations are located. Development of Alternatives Instead of the current centralized conservation model that fails to protect the rights of indigenous, the groups call for conservation alternatives led by indigenous communities themselves: “An Indigenous Community Conservation Area in Kamoethway and plans to establish the Salween Peace Park are examples of this alternative model that promotes a people-centered approach to conservation, supporting local people and institutions to strengthen traditional methods of forest protection. This bottom-up model of community-led conservation is proving extremely successful both in Tanintharyi and other parts of the globe, signalling an important paradigm shift for conservation. Within this model indigenous communities can be recognized as the owners, managers and protectors of resources with positive results for both human rights and biodiversity conservation” [1, page 6]. Why? Explain briefly. The conservation area was established excluding and dispossessing customary and indigenous communities, as well as internally displaced people. Pollard, E. H. B., Soe Win Hlaing& Pilgrim, J. D. (2014) Review of the Taninthayi Nature Reserve Project as a conservation model in Myanmar. Unpublished report of The Biodiversity Consultancy, Cambridge, England. Padoch, C., & Pinedo-Vasquez, M. (2010). Saving Slash-and-Burn to Save Biodiversity. Biotropica, 42(5), 550–552. 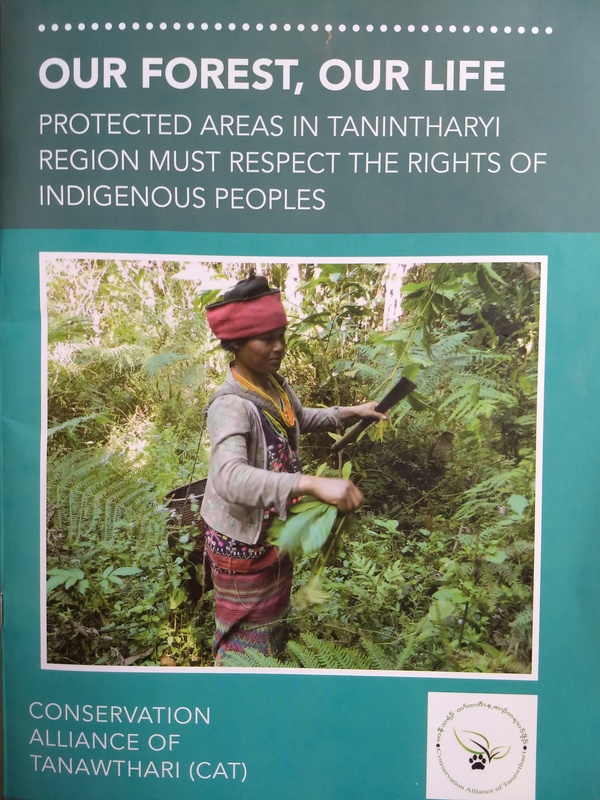 Conservation Alliance of Tanawthari (2018) "Our Forest, Our Life: Protected Areas in Tanintharyi Region Must Respect the Rights of Indigenous Peoples". Mongabay article by Katie Arnold, 23 September 2016 "‘We are revolutionaries’: Villagers fight to protect Myanmar’s forests" (accessed online 23.05.2018). Conservation Alliance Tanintharyi (CAT) Report Cover Source: .